In the beginning was the Logos, and the Logos was with God, and the Logos was God. It was in the beginning, with God. Everything came about through it, and without it not one thing came about. What came about in it was life, and the life was the light of mankind; and the light shines in the darkness, and the darkness did not overcome … the light, which illuminates every person who comes into the world. … And the Logos became flesh and lived among us, and we have seen its glory. Let me ask what word or phrase first comes to mind when I mention “Christ.” Yes, nearly everyone will respond “Jesus.” Now, what word first comes to mind when I mention “Light”? For early Friends, the response would have connected “Christ” to “Light,” first and foremost, even though they never articulated their understanding quite so directly. The existing blasphemy laws – especially in regard to the doctrine of trinity – and later self-censorship prevented this. But read their writings, and you will notice that early Quakers usually use the word “Christ,” rather than “Jesus.” When the two are used together, it’s typically as “Christ Jesus,” rather than “Jesus Christ.” And when “Jesus” is used alone, it’s often with some modification, such as “meet together in the name of Jesus,” that is, the power of Jesus, which Friends often expressed as Light. For a long time, this puzzled me, and I dismissed it as quaint language. Now, however, as I connect the dots, I find something more remarkable emerging. When the Quaker movement spread forth, blasphemy was a capital crime in England. Early Friends had to be judicious not to cross its subtle line – and in a few cases, sympathetic judges may have spared Quakers, including George Fox, from an otherwise scandalous death. The stakes were high. In his 1650 conviction in Derby on blasphemy charges and again in 1653 in Carlisle, Fox himself narrowly escaped a death penalty. After 1652, all Quaker literature would be vetted by committee before publication to reduce the chances of incidental capital offense. Even so, already reeling from the 1656 conviction of its leading minister, James Nayler, Friends were hit again in 1668 with the imprisonment of young William Penn, accused of denying the trinity. As a consequence, Friends could not openly articulate the revolutionary dimensions of their new theological understanding. This left major gaps in any Quaker teaching in regard to central tenets of conventional Christianity, especially in terms of the crucifixion, resurrection, atonement, and trinity. These were subjects Robert Barclay’s definitive Apology (published in Latin in 1676 and in English translation in 1678) would gloss over, rather than clearly redefine within the context of Light-based theology. These gaps would reappear to haunt later generations of Friends, including our own. Early on, they called themselves Children of Light – a Biblical phrase from Luke 16:8, John 12:36, Ephesians 5:8, and 1 Thessalonians 5:5. They were far from the first to use the concept of light in religious discussion – it is found, after all, across spiritual traditions and eras. Even the teaching of a Christ within an individual was being presented in some small sects in the turbulent atmosphere of mid-1600s in England, when Quakers fused a number of similar elements into their own movement. Early Friends skillfully managed to couch their experience in language that largely skirted accusations of being heretical by the general society, while somehow containing a nuanced or even an alternative concept of Christ within the experience of Quaker practice. I see clues of this, for instance, when historian Arthur J. Worrall discusses New England minister Job Scott of nearly a century and a half later: “He carried to extremes the beliefs which critics had always maintained were basic to Quakers and which Friends had in some fashion or other denied publicly for a century.” Specificially, Scott was finally coming close to clearly articulating the underlying structure of Quaker theology. Other hints turn up much earlier, as John Punshon (Portrait in Grey) suggests regarding William Penn in 1673: “Though he asserts that the light, as Christ, is personal, he does use the pronoun ‘it.’ The critics claimed the Quakers’ failure to fix the reference of ‘the light’ securely enough to the Christ [more specifically, Jesus] revealed in Scripture, leads to imprecision, misunderstanding, and ultimately to some kind of unitarianism.” In this passage, Punshon slips from one understanding of Christ, as Light, to the more prevalent understanding of Christ as Jesus, the person, unintentionally illustrating one reason many would have difficulty perceiving the Light as an alternative definition of Christianity itself; what Penn’s critics wanted was a faith that could be seen in the context of history, rather than an encounters as a living experience in the present. James Nayler, the most systematic theologian of the early Quaker movement, wrote eloquently of the Light, but in the end, he insists it can be known only through experience – a line of reasoning that would frustrate those who demanded answers to what is ultimately a tautology, or circular argument. That is, the Light is to be known through the heart, rather than the mind alone. In fairness, much of the problem originates in the New Testament, long before Quakers. In his epistles, Paul speaks passionately of an intimate experience of Christ. “For me to live is Christ,” for instance. Remember, though, Paul never met Jesus in the flesh: what, then, could he mean, actually? The gospel of John, moreover, stands at odds with the more history-driven synoptic gospels of Matthew and Luke. (Mark can be seen as somewhat more aligned with John.) The opening chapter of John, especially, lays out an array of images that form the core of Quaker expression from its earliest days – most notably its proclamation of Light associated with Christ. John also introduces the concept of Logos, often translated as Word, which turns out to be a philosophical and mystical Greek concept predating Jesus by at least 700 years. Among its varied definitions were reason, plan, the universal principle through which all things are interrelated and all natural events occur, the soul of the universe, an active rational and spiritual principle that permeated all reality, the underlying connection between opposites (for example, the way health and disease define each other, or good and evil or hot and cold, etc. ), even beauty. In addition to its Greek proponents, the concept is found in Indian, Egyptian, and Persian philosophical and theological systems. In Greece its development can be traced from the mathematician Pythagoras, who also claimed to be resurrected, and Heracleitus through the Stoics through Zeno of Citium through Plato and his followers. Philo of Alexandria, a 1st-century C.E. Jewish philosopher, taught that the logos was the intermediary between God and the cosmos, being both the agent of creation and the agent through which the human mind can apprehend and comprehend God. It also appears as Sophia, or Wisdom, in Jewish thought. While “Christ” is often described as Greek for the Jewish concept of Messiah, and then both are traditionally ascribed to the person of Jesus, the perspective of Logos shows something quite different at work. This is no earthly king, but an agent in the midst of reconciliation and transformation. Part of the problem in articulating the Quaker experience actually goes back to the very beginning of the Hebrew Bible itself. How do we reconcile the concept of a deity that is so incomprehensible and vast that even its name cannot be spoken, on one hand, with a very intimate and personal relationship, on the other? In many traditions, animal sacrifices – even human sacrifice – in temple ritual becomes one way of bridging this conflict; in the Hebrew texts, angels become another. In the New Testament, Jesus, Christ, and the Holy Spirit also make the universal infinity known personally. Friends, in turn, emphasized this personal encounter as Light, with an implicit awareness of the Logos dimension. The concept of Logos was in the air of the time, through neo-Platonists in Italy and alchemy, especially. The brilliance of the early Quaker movement came in blending these diverse elements into an experience-based faith and their application of this as metaphor, rather than empirical reasoning. Metaphor is a thought process that is quite different from the legalistic approach found in fundamentalists of our day or in the Calvinist churches of mid-seventeenth century England. Metaphor, in fact, baffles those who attempt to be didactic. In the Princeton Encyclopedia of Poetry and Poetics definition, metaphor is a “condensed verbal relation in which an idea, image, or symbol may, by the presence of one or more other ideas, images, or symbols, be enhanced in vividness, complexity, or breadth of implication.” The entry then continues for more than five pages of amplification. This definition introduces other concepts. Image, for one, which is typically but not exclusively visual (sound, such as the ringing of church bells, or taste, such as a ripe fig, might be used as images) and symbol, for another, where one thing can stand in for something else (Jacob’s ladder, for instance, goes from being a simple ladder to a pathway to the Divine). While simile compares two things side-by-side, metaphor overlaps and compresses them. Love is no longer like a rose, it becomes a rose, fragrant and blooming. Divine Light is something apart from the sun, a fire, or an incandescent bulb, though in ways, it also resembles these. The Light early Friends proclaimed was not sunlight or candlelight, after all, but Logos, Christ, Life, and a number of other concepts compressed into its rolling expression. To the early Quakers, Light was one way of designating a life-changing encounter with what they identified as Christ. While a host of synonyms appears in historic Quaker literature – including Christ Within, the Light of Christ, the Seed of Christ, the Truth, the Witness of Christ Within, the Inner Man (with its implicit Inner Woman), the new Adam, and similar combinations – what we do not find is Inner Light itself. Rather, the closest we come is the Light Within or the Inward Light. Light was the definitive message of the Quaker movement. Contrary to authoritative sources like Encyclopedia Britannica or The Associated Press Stylebook, however, it was never “Inner Light,” which comes to us with a much different meaning. In fact, the first references to Inner Light do not occur until two centuries after Friends first began shaking the British Isles. I am currently unable to find the term used publicly by Friends before 1878, when Ohio Yearly Meeting (Gurneyite) issued a minute in which they “repudiate the so-called doctrine of the inner light, or the gift of a portion of the Holy Spirit in the soul of every man, as dangerous, unsound, and unscriptural.” The Oxford English Dictionary does cite an 1856 usage in a volume on mysticism, where the author is summarizing the teaching of George Fox; this work, however, does not appear to be from a Quaker source. And Mitchell Santine Gould, in “Walt Whitman’s Quaker Paradox” (Quaker History, Spring 2007), quotes a November 1855 review of Leaves of Grass published in the seminal Criterion magazine. There, Rufus Griswold observed, “Unless we admit this exhibition to be beautiful, we are at once set down for non-progressive conservatives, destitute of the ‘inner light.’” Gould also remarks, “Griswold connected the dots between Whitman’s forbidden sexuality emerging from the darkness of the closet, the shocking liberalism of the Friends of Human Progress, and the Quaker notion of ‘inner light.’” Gould then describes the Friends of Human Progress as an “’ultra’ radical Hicksite offshoot” with ties among western New York Quakers. What I suspect is that within Hicksite meetings, informal spoken usage was slipping from Inward Light to Inner Light, without being recorded directly. Our awareness of this shift is instead reported first by its critics. Until then, in Quaker publications, at least, it was always Inward Light or the Light Within or some variant – a much different concept. If modern Friends turn toward the Light for comfort or inner peace, this was not the introductory case for many of the earliest Quakers, who were instead torn apart by it and remade. Here it comes as a searchlight or beacon, rather than a little candle or even one’s conscience. It’s what exposes one’s conscience. It is light shining into a room, not an electrical switch to turn on a bulb already there. Modern Friends have assumed that “inward” was synonymous with “inner” or somewhere in the writings of George Fox or other early Quakers, the term “inner light” must have been used, but so far, the search has been in vain. Early Friends were speaking of something quite different from what their modern heirs claim. George Fox’s most frequent Biblical citation, I’m told, is Galatians 2:20, where Paul proclaims “Christ liveth in me,” now extended to “Christ in you, Christ in me.” That understanding is thoroughly revolutionary, moving Christ far from any identity from Jesus solely. To see you as Christ, or me as Christ, shakes traditional Christianity to its foundation. That is, if the Light is Christ, and we receive the Light, we become Christ-infused – not just Christ-like. No wonder early Quakers wept and trembled! Think about it: the power that filled Jesus can also fill us. This is what early Quakers had to be careful not to say, even when they experienced it. This sounds, too, like the intense religious experiences reported by early Friends, except that I would argue their encounters plunged not only into the unknown parts of the mind (or, as Bly explains later, the three different regions of the brain) but also into intuitive, emotional, and even muscular and tactile awareness. Rather than dragons, we could say they were riding beams of Light, sometimes bouncing with reflections, sometimes opening through prisms into rainbows, sometimes burning away debris. A central quality that so baffled and alarmed critics was the absence of orderly progression in these Quaker utterances. Rather than moving logically from point A to point B to point C in syllogistic exercise, Friends simply jumped in at C.
Cope observes, “The ‘incantatory’ style is an epistemological tool: it appears when Christ is speaking within the Quaker, and showing forth the Word which is Alpha and Omega, beginning and end of understanding the runes of eternity.” His point becomes clearer once one recognizes how, in the Quaker metaphor, Light serves as another name for Christ and the Word or Logos. That is, the Light speaking through the individual brings enlightenment. In a similar compression, the passage from Genesis could also be turned: “God emitted light and it sounded good”; the sequence of events becomes one overlapping wholeness. The mention of each of us having the potential of being the mother of Christ, incidentally, enraged Scott’s opponents the most. From the start, the Society of Friends has always been haunted by the shadow of Ranterism – one of the movements that erupted when Quakers first appeared. In short, Ranters believed that being filled by the Light liberated them from moral constraints, and they could do whatever they pleased. Quakers, in contrast, have insisted that being filled with the Light requires submission and obedience to the commands of Christ, especially as revealed in the life of Jesus. A few decades later, from the Orthodox side of the split, Joseph John Gurney attempted to translate early Quaker experiences of the Light into the Trinitarian paradigm of orthodox Christianity. He concluded that the Light they spoke of must be akin to the Holy Spirit in the teachings he knew. But because he presumed that their references to Christ must have been synonymous with Jesus, he failed to make the more appropriate – and revolutionary – linkage. The ancient Quaker understanding of Christ as Logos and Light would have more accurately fit into a Trinitarian model as the Holy Spirit, rather than Jesus. Here, in the restored Quaker perspective, rather than standing in the shadow of Jesus (or downstream from him), the Holy Spirit is revealed as the element that empowered Jesus, connecting him with God the Father (another metaphor, by the way). Moreover, the Holy Spirit is what connects us to God the Father. In this interpretation and experience, the Holy Spirit is more central to Christianity than is Jesus – at least within this dynamic of relationship. Many Christian denominations have been puzzled, wondering what to make of the Holy Spirit or even whether its work was limited to “Bible times.” A theology of the Light, however, may leave one wondering what to do with Jesus. Let me say I believe these answers can be accomplished, though not within the time constraints of the presentation at hand. In the most concise argument, I see the events surrounding Calvary as unleashing a history-changing outburst of the Light in ways that would affect large groups of people, and not just isolated prophetic individuals. I would also see Jesus as the embodiment of what a Christ-filled person can be – something far more than merely human. We, as Friends or Quakers or Children of the Light, lay our claim to that legacy. I would like to emphasize one more dimension of the early Quaker understanding. While early Friends insisted on a concept of Inward Light, rather than Inner Light, they did have a corresponding metaphor for the inward response itself – the Seed, sprouting and bearing fruit as an individual awakened to the influx of Light. More than the modern Quaker expression, “that of God in all people,” the Seed image conveys a sense of a personal and growing response to God’s love for us. Here, the combined Light/Seed metaphors expand the concept first voiced at the beginning of Genesis, where humans are created in God’s image. The concept of having a spiritual rebirth also becomes apparent. In addition, there are parallels to the realms of modern science, with Light as a metaphor of energy and Seed as a metaphor of matter. As I contemplate a Logos-based theology, I sense a wonderful balance in having something as ethereal as Light being countered by something as earthy as Seed. For whatever reason, in this context I always think first of fruit, before I think of seed as grain. Here is something that can take root, that becomes a grounding for Soul, that even becomes flesh. If the Inward Light is the Spirit of Christ pouring into the human heart, the Seed then opens in response and extends its leaves to receive this energy. Here, then, is an answer to the question of why the Light must seek the Light. Here is something the Light stimulates and opens. I think of a Gary Snyder poem about righteousness that opens, “The Dharma is like an Avocado!” – even though his Zen Buddhist look at Seed imagery in relation to religion bends ways my Logos perception doesn’t. Symbolically, the forbidden fruit of Eden also contained seeds. Now, however, Light transforms the expulsion, a reversal much like Calvary’s relation to sacrifice, kingdom, and death – a positive prompting of the Law or Dharma written on our hearts rather than as a negative set of prohibitions from without. In a leap, I find myself substituting “seed” for “soul,” and Tarrant deepens the dimension: Seed is always learning, always fallible. Seed is weak because it loves – which is, of course, its strength. Denser than the spirit, seed gets in the way of the arriving light just enough, delaying it, making it linger. On the other hand, spirit knows that seed, in itself, does not have enough of a center. When seed is too dominant, we lose connection with the infinite source and fall under the thrall of the world. Seed wanders ever deeper into the marsh of emotion. If seed gives taste, touch, and habitation to the spirit, spirit’s contribution is to make seed lighter, able to escape its swampy authenticity, to enjoy the world without being gravely wounded by it. And so on. When we set out to examine the Quaker doctrine (or teaching) of Light, few of you expected to be concentrating on Christ and Logos, especially in the context of metaphorical thought. If you find some of my conclusions upsetting, just imagine how it will be at the other end of the Quaker spectrum, where pastoral Friends will have many of their teachings challenged, if not overturned. This is truly scary stuff. The idea of becoming not just Christ-like, but Christ-infused can lead to a perception of “Christ Mike” or “Christ Barbara” as part of our Christ community. Here, at the least, the historic Jesus becomes a standard to keep us from veering off into Ranterism once more. His question brings us to the recognition that our inquiry is not for the sake of history alone, but rather for our own enlightenment in the world we face today and the turbulent times we see coming ahead. Freed of many of the earlier constraints and inhibitions, and exposed to new fields of knowledge, Friends may now begin to think more openly and fully about the implications in our legacy of Light. IDENTITY: Among quietist Friends like us, there is the longstanding question, “Are we Christian or not?” Indeed, a tension is often perceived between “Christocentric” and “universalist” Friends. Acknowledging an alternative definition of Christianity based on Light or Logos erases this division, since both are now seen as Christian, and the questions now shift to the life and work of Jesus, apart from the constraints of conventional dogma. At the other end of the Quaker spectrum, the tension has involved wondering to what extent evangelical Friends differ from other Protestants, especially. Here, the Light and Logos can be presented as the reason they emphasize the Holy Spirit in their worship; realizing this is also Christ itself at the heart of their worship will result in a distinctive identity, indeed. RECONCILIATION AMONG FRIENDS: To understand that the Light encountered by quietist Friends is identical to the Holy Spirit among evangelical Friends may allow Quakers to perceive a shared, common experience, albeit in much different settings. From there, we may then see how our understandings of Jesus may differ, discuss what we find essential or inconsequential, and learn from each other. In either case, the basis of the dialogue would be on our individual experiences of this Light or Holy Spirit, which becomes our shared source. How, for instance, do we pray? COMMUNITY, TEACHING, AND MEMBERSHIP: The transmission of any tradition requires a common language. Creativity, in turn, builds on previous advances and models. By having clearer definitions of distinctively Quaker concepts, we may more readily guide others into deeper faith and practice, building on those who have gone before us and adding to their wisdom. OUTREACH: As we strengthen our understanding of Christ as Logos at the core of Quaker experience, we are enabled to reach out to other faith traditions afresh. Quietist Friends may reach out to other mystical practices to express a unique understanding of Light as Christ. Evangelical Friends may reach out to other Christian bodies with a clearer emphasis on Spirit-led worship and practice. In either case, we present a definition of Christ that circumvents many of the intellectually troubling points in conventional Christian teaching. PRACTICE: The answer to what we do in Quaker worship comes quite simply in the ancient advice, “Mind the Light.” This is how Friends independently rediscovered meditative practices that are widespread in Asian traditions. In addition, to “walk in the Light” means living the way Christ directs us: this is not mere theory or speculation, but daily experience and encounter, strengthened through voices throughout history. THE UNFINISHED WORK: While much of the Light metaphor can be readily reconstructed from Biblical texts, and then placed in a historic Quaker context, the corresponding Seed metaphor remains far more unfinished. Here I see an opportunity for contemporary Friends to greatly add to theological understanding, recasting what had been conveyed as Inner Light experience into a more powerful dynamic, while also drawing on insights from psychology, comparative religion, the fine arts, and other advancing fields. Let me return for a moment to the practice of metaphorical thinking, which I find as the crux of Quaker experience and teaching. Writing from a Buddhist point of view, Jane Hirshfield (Nine Gates) observes: “Human vision divides. But symbols – and particularly words are perverse. In the face of our human desire for understanding, they pose riddles before which our ability to read the face of things must either deepen or fail.” In addition, “every poem remains an attempt to name with some fidelity some complex aspect of the human experience and keep it available through time.” Although James Nayler and Isaac Penington were not writing poetry, at least in the traditional sense, they and other early Friends were applying metaphorical thinking in their presentations. With their onrush of overlapping images and concepts, their writings have more in common with contemporary poetry than with verse from their own time, which constrained itself to more Aristotelian logic. In addition, considering Nayler’s repeated calls to humbleness, I hear Hirshfield answering, “it is in the spirit of non-possession and surrender that art flourishes best” and her sense of “enlightenment as becoming a person of ‘no rank.’” Here we might see early Quaker voices aligned with the poetic stream. In closing, let me add one more consideration to the metaphor of Light, this drawn from 1 John 4. Within his argument for acknowledging that Christ has come in the flesh in the person of Jesus, the author makes another set of remarkable connections: “Dear friends, let us love one another, for love comes from God. Everyone who loves has been born of God and knows God. … God lives in us and his love is made complete in us. We know that we live in him and he in us, because he has given us of his Spirit. … God is love. Whoever lives in love lives in God, and God in him. Love is made complete in us …” The substitutions, I think, are easy enough: Christ and Light for God, or Light for love. Let us walk in God’s love, then, moving through metaphor into action, sustained by Light and rooted in Seed. This essay was initially published as a chapbook in 2008 after a workshop presentation at Dover Friends Meeting in New Hampshire. It is copyright by Jnana Hodson. 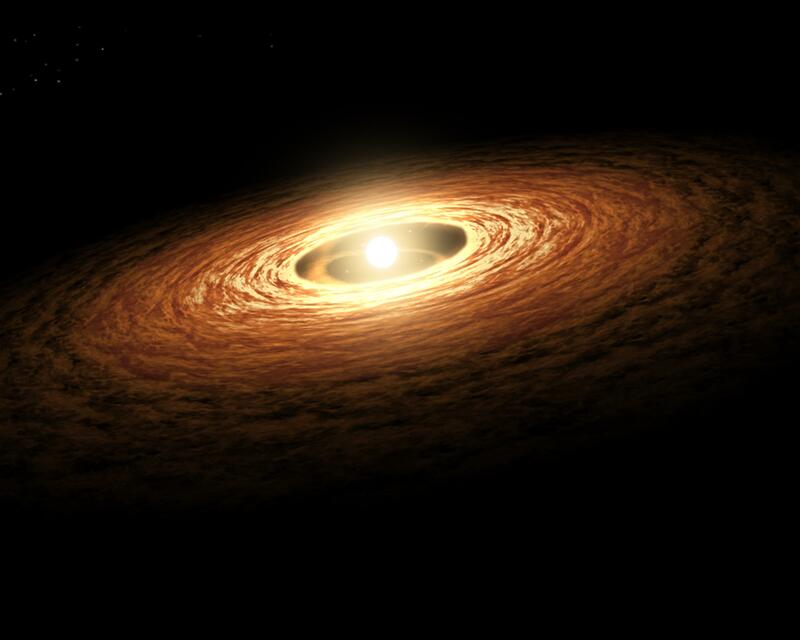 Silicate crystal formation in the disk of an erupting star is shown in this NASA/JPL-CalTech image. These posts are personal reflections drawn from spiritual practice as a Quaker, a member of the Religious Society of Friends. My hope is that they will help you deepen your own faith, in the richness of your own chosen pathway.